Scientists at Washington University School of Medicine in St. Louis are reaching out to patient advocacy groups and offering to decode the DNA of 99 patients with rare diseases to help find the genetic alterations responsible for their illnesses. 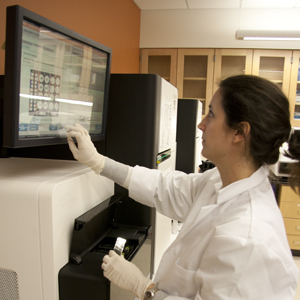 Research technician Maggie O’Guinn prepares a DNA sequencer at Washington University’s Genomic and Pathology Services. Its scientists are reaching out to patient advocacy groups and offering to sequence the DNA of 99 patients with rare diseases. The patients’ DNA will be sequenced at the university’s Genomics and Pathology Services (GPS) at no cost to patients or the advocacy groups. The new effort is known as the Rare99X Clinical Exome Challenge. Collectively, an estimated 7,000 rare diseases affect some 25 million Americans. They range from Huntington’s disease, a neurodegenerative disorder diagnosed in adulthood, to Neimann-Pick, a metabolic disorder which can occur in infancy. In recent years, advances in technology have made DNA sequencing cheaper, faster and more accurate. For patients with rare diseases, scientists now can use that technology to find the genetic error or errors that most likely caused their illness. Many rare diseases are thought to be caused by genetic variations in the small portion of the DNA that codes for proteins, collectively known as the exome. This is the part of the DNA that will be sequenced. By early last year, exome sequencing had already helped researchers identify the genetic causes for 39 rare diseases. Scientists think this is only the beginning. “Identifying and validating gene alterations linked to disease is now enabled by the advent of new sequencing methods that allow for highly sensitive analysis of the patient’s genetic makeup,” says Karen Seibert, PhD, director of GPS and research professor of pathology and immunology. GPS will begin accepting proposals for exome sequencing from patient advocacy groups on Feb. 29, which has been designated as Rare Disease Day. Final selection of the projects will occur this summer. A panel of genetics experts will review the proposals to help GPS leaders choose the projects most likely to improve care of patients with rare diseases. 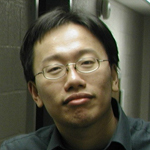 Lin is the founder of the Rare Genomics Institute, a nonprofit that designs personalized research studies for rare disease patients, connects them with the latest technology and top researchers and helps secure funding with an online platform. The institute’s mission is to make gene sequencing and other advanced techniques accessible to patients with rare diseases. The institute is preparing online training sessions and other activities to help advocacy organizations create their proposals for the Rare99X Clinical Exome Challenge. In addition to providing exome sequencing for rare disorders, Seibert notes that GPS offers clinical genetic tests for patients with more common diseases like cancer or heart disease. Mutations underlying those diseases can help physicians determine the best treatment options for patients. For more information, go to http://raregenomics.org/rare99x.